Shah Abdul Latif Bhittai (also referred to by the honorifics: Lakhino Latif, Latif Ghot, Bhittai, and Bhitt Jo Shah) (18 November 1689 – 1 January 1752) (Sindhi: شاه عبداللطيف ڀٽائي‎, Urdu: شاہ عبداللطیف بھٹائی‎) was a Sindhi Sufi scholar, mystic, saint, and poet, widely considered to be the greatest Muslim poet of the Sindhi language. His collected poems were assembled in the compilation Shah Jo Risalo, which exists in numerous versions and has been translated into English, Urdu, and other languages. His work has been compared frequently to that of the Persian poet Rūmī. Seyyed Hossein Nasr, an emeritus professor of Islamic studiesat George Washington University, described Shah Latif as a “direct emanation of Rūmī’s spirituality in South Asia.” He is also known as the poet of Sindh. 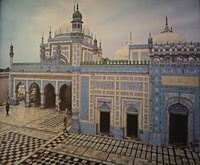 Shah Abdul Latif was born to Shah Habib in the village of Hala Haveli, a few miles to the east of the present town of Bhit Shah(named after him), on November 18, 1690 CE. 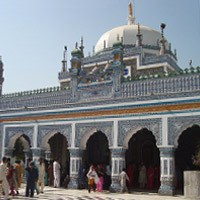 Latif was raised during the golden age of Sindhi culture. His first teacher was Akhund Noor Muhammad Bhatti although he was largely self-educated. Although he received little formal education, the Risalo provides proof that he was well-versed in Arabic and Persian. The Qur’an, the Hadiths, the Masnawi of Maulana Jalaluddin Rumi, along with the collection of Shah Karim’s poems, were his constant companions, copious references to which are made in the Shah Jo Risalo. In his poems he writes about Sindh and its neighboring regions, he mentions distant cities such as Istanbul and Samarqand as well as Sindhi sailors (Samundi), their navigation techniques, voyages as far as the Malabar coast, Sri Lanka and the island of Java. Most of the information on the life of Bhittai has been collected from oral traditions. A Pakistani scholar, educationist, and a writer of plays, dramas and stories, Mirza Kalich Beg has collected details about the early life of Shah Bhittai from the dialogues that he has constantly held with some of the old folks, still living at that time, who knew these facts from their fathers and grandfathers for they had seen Shah Latif in person and had even spoken to him. Their salmon-coloured clothes were covered with dust. The lonely ones never talk to anyone about their being. They move about unmarked amongst the common folk. A 16-foot-high statue of Bhitai was unveiled in front of the Bhit shah rest house on the occasion of his 274th urs. The statue was sculpted by Nadir Ali Jamali, who is associated with the fine arts department of the University of Sindh. It is planned to be permanently put up at the centre of the Karar Lake next to the Bhitai shrine. It took ten months to complete. The Urs commences every year from 14th Safar (2nd month of Hijra calendar) and lasts for three days. In 2017, the 274th Urs of Shah Abdul Latif began at Bhit Shah, and Mai Dhai, Abida Parveen and many other singers and artists performed. The ceremony’s opening was done by interim Governor Sindh.